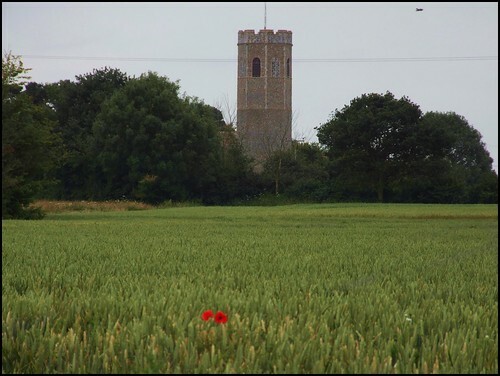 St Andrew is one of the Saints, a group of twelve remote, scattered and traditionally lawless parishes not far from the Norfolk border. There is a sense in which St Andrew is in the Saints, but not of them: it looks away from the others to north and east for the other parishes in its shared benefice. There is no real village here, but that is par for the course with the Saints of course: only three of them have a proper village in their parish. St Andrew has more houses than most, but they are scattered around commons, separated by winding hedged lanes. All in all, the parish is rambling and incoherent, and somewhat difficult to grasp. This grand round-towered church sits at a bend in the road with the former rectory for company. As is common in this part of East Anglia, the tower has an octagonal bell stage, and although some round towers were built from scratch in the 13th and 14th centuries, it is likely that this top was built onto a Norman tower, probably contemporarily with the body of the nave, which despite the acquisition of later Perpendicular windows is essentially a long Norman church. The chancel was probably added at the time the tower was topped off. A good modern statue of St Andrew gazes out from the niche on the porch, which was built right on the eve of the Anglican Reformation. The graveyard he looks out on is a delight: there has been almost no clearance of the older gravestones, and it must be a genealogist's dream. The original entry for this church on the Suffolk Churches site back in 1999 caused something of a war of words. At the time, it was one of just three of the churches in the Saints which I'd found locked without a keyholder. I had got hold of the telephone number of one of the then-churchwardens: she was most unhelpful and off-putting, and I said so. Rather surprisingly, I then received a number of e-mails from people telling me that they had similar experiences, including one from a man in Canada who had eventually got inside and found the interior in a filthy state. As you may imagine, reporting all that on this website didn't go down terribly well, but of course I had no way of being able to deny my Canadian correspondent's account. But there were other churches to see, and coming back to this relatively insignificant church with little hope of getting in was not on my list of priorities. And then, something extraordinary happened. In December 2001, workmen undertaking a repair to the south wall uncovered a remarkable scheme of wall paintings. They bear a similarity to the 14th century wall paintings at nearby North Cove, but what makes them unusual is the main subject, the depiction of a wheel of fortune. It is the only known example in East Anglia, although it is possible that the painting on the south wall at Barton Bendish St Mary in Norfolk may show something similar. The wheel of fortune is a variation on the usual Judgement scene, with a seated figure at the top, and two other figures apparently tied to the wheel, one rising and the other falling. The image of a wheel of fortune was a potent one in late medieval times. It was derived from a work called the Consolation of Philosophy, by the 6th Century Roman philosopher Boethius. By the 13th and 14th centuries, this book was the most widely copied work of secular literature in Europe, central to a university education and formation for the Priesthood. As such, it informed and infused English medieval Christianity, particulary at the time of the Black Death and afterwards. Famously, Boethius has Fortune tell us that inconstancy is my very essence; it is the game I never cease to play as I turn my wheel in its ever changing circle, filled with joy as I bring the top to the bottom and the bottom to the top. Yes, rise up on my wheel if you like, but don't count it an injury when by the same token you begin to fall, as the rules of the game will require. This fatalism is also seen expressed in such more common wall painting scenes as the Three Living and the Three Dead, where the noblemen out hunting are reminded by corpses in various states of decay that as you are, so once was I, as I am so you must be, therefore prepare to follow me. The suggestion is that it is of no use to store up earthly treasures, but the wheel is also intended to remind the viewer of the temporality and uncertainty of these things, and that it is far better to concentrate the mind on higher thoughts. In the 15th century, there was a move away from classical mysticism towards an enforcement of the orthodoxy of the Catholic Church, mainly because of the way in which the increasing wealth of a rising middle class was paying for reminders of the significance of praying for the dead at that time of pestilence and disease. These wall paintings were probably covered up during the 15th century, a century or so before the protestant iconoclasts came along. Around the wheel are other figures, including the dead rising from their graves, and east of the window are a queen and an angel, probably part of a larger scene. The pitting in the figure of the queen is almost certainly not iconoclasm, but simply the way that the surface has been prepared for a covering of plaster. A curiosity on the wall opposite is an architectural drawing of a Romanesque building, which may well predate the scenes on the south wall. The wall paintings are of such significance that the story of their discovery reached a national audience. But Ilketshall St Andrew wasn't finished with extraordinary events, because a year or so later the church was struck by lightning. Twice. It took until 2006 for the building to be reopened, and what a transformation! You step into a clean, bright, long church, which is obviously well-loved and cared for. At the west end of the south side is a 16th century bench back carved with cherubs and the large initials JE. behind it, the 15th century font looks most imposing on its pedestal.There is a pleasing feeling of a rustic 19th century restoration, as if the blacksmith and the plough boy would still be thoroughly at home here. The great royal arms of Charles II are currently away undergoing restoration, but they are expected to be returned to the church during 2008. The bad news is that Ilketshall St Andrew church is still kept locked, and there is still no keyholder notice. This is at a time when every single other church in the Saints is now open every day, and other local churches which used to be kept locked without keyholders - Redisham and Worlingham, for example - now display prominent notices telling you where you can find the key. St Andrew is regularly open to visitors for a couple of days each month, but that is by no means the same thing as being available to strangers and pilgrims who turn up on on spec to take a look. And it is not as if anyone can actually steal the wall paintings, is it. I arrived here on a bike ride in July 2008, and my heart sank to discover that there still appeared to be no way in. I tried ringing the two churchwardens on the noticeboard, hoping that neither of them would turn out to be the woman who had torn me off a strip nine years before; however, as it turned out, neither of them were in. I have a small acquaintance with the Rector into whose care St Andrew has recently been moved (I can't help thinking that he'll take a dim view of it being kept locked) and I thought about ringing him, but I knew he was on study leave. There was another number on the board of a minister who had retired locally, and he very kindly put me in touch with a lovely lady who lives near to the church. She quickly came out and let me in. While we chatted, two more people came up to the church and asked to see inside, and I couldn't help imagining a fairly constant succession of arrivals hoping to see the wall paintings, but having to leave disappointed. This is not a terribly satisfactory state of affairs, but perhaps it will change. The paintings are well worth a view, but even without them this is a lovely church, a place to stop and sit awhile, if only that were possible.